DES MOINES – The Iowa Barnstormers have signed defensive lineman Izaah Burks to the 2019 roster, Head Coach Dixie Wooten announced today. 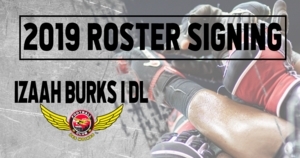 Burks (6-4, 305, Bowling Green) joins the Iowa Barnstormers for his first season in the Indoor Football League (IFL). Collegiately, Burks played four years at Bowling Green State University where he appeared in 44 games (starting in 15) and racked up 90 total tackles, 4.5 sacks, and three passes defended. Following his collegiate career, Burks signed with the Green Bay Packers as an undrafted free agent. Burks spent the 2017 season on the Packers practice squad, but was released following the season. Burks signed with to the New York Giants Training Camp ahead of the 2018 NFL season, but fell short on making the final roster. Season Tickets for the Iowa Barnstormers 2019 season are available now for as low as $80 per seat. Don’t miss a minute of the action as the Barnstormers defend their Championship Title! For more information, call the Barnstormers at (515) 633-2255 or log on to www.theiowabarnstormers.com.